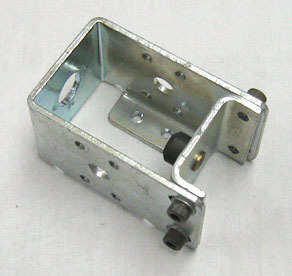 Drop target bank reset coil mounting bracket as used on most Gottlieb pinball machines- early and late models. Original part # B-16194. Includes coil stop and stop mounting screws and washers. Used part in good condition. GOTTLIEB: Black Hole, Charlie's Angels, Dragon, Genie, Haunted House, James Bond 007, Sinbad, Totem, more?